Summary: During peak construction season, about a fifth of the American highway system is under construction with over 3,000 sites. Car accidents can occur at the unlikeliest of locations and cause serious injuries. For example, car accidents can occur around construction sites. There are several conditions that lead up to such accidents including construction debris, lack of proper warning signs, and the distraction caused by ongoing construction activity. These conditions pose a serious hazard to those driving and working around a construction site. A construction site poses a danger to construction workers, including the drivers of vehicles and equipment operators, and pedestrians. Construction workers have been injured and killed by drivers who lost control of their vehicle. A driver can lose control because of a variety of reasons including distractions, poor weather, sudden movement of a machine or construction vehicle, or because of another vehicle around the site. As you approach a construction site, there are warning signs that caution you about workers on the shoulders or roadways and about speed limit. Many car accidents on construction sites are caused because the site is not properly marked by signage, flashing lights, or any other signs that signal the advancing traffic and give them sufficient time to prepare themselves. At times the road being constructed or repaired is uneven and has sharp and dangerous drop offs in the surface, leading to serious car accidents including rollover accidents. The Occupational Safety and Health Administration (OSHA) has compiled a list of the hazards at construction sites for on-site workers and for pedestrians and drivers that are walking or driving by a construction site. According to OSHA, during peak construction season, about a fifth of the American highway system is under construction with over 3,000 sites. In the United States, you can find a work zone every 100 miles of highway. 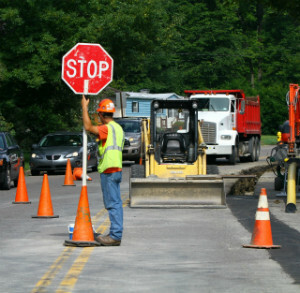 Every day, an average of three work zone deaths occur in the United States. More than 40,000 people are injured every year in construction site accidents involving cars and semi-trucks. Many of these injuries and deaths are preventable. Car accidents on construction sites are more common that you think. Both private and public construction site dangers cause serious injuries and even death. It is extremely important for a driver to be aware of any construction activity in progress when traveling on roadways and highways. If you have been injured in a car accident on a construction site, consult a St. Louis car accident lawyer to understand your legal rights. Call The Hoffmann Law Firm, L.L.C. at (314) 361-4242 for a free consultation.